Looking comfortable. Feeling comfortable. That’s what modern farmhouse living is all about. 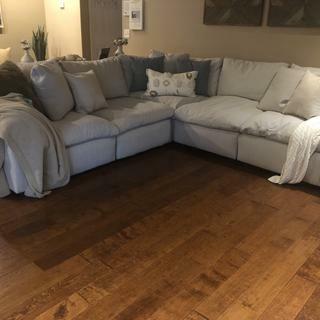 What better way to embrace the modern farmhouse trend than with the Savesto 5-piece sectional in ivory white. As casually cool as they are luxurious, the sectional’s reversible back and seat cushions are feather filled and wrapped in a cottony soft fabric for cloud-like comfort. Crisp, clean lines and track arm styling simply work. Right-arm facing corner chair Width: 40.00"
Right-arm facing corner chair Depth: 40.00"
Right-arm facing corner chair Height: 37.00"
Left-arm facing corner chair Width: 40.00"
Left-arm facing corner chair Depth: 40.00"
Left-arm facing corner chair Height: 37.00"
Armless chair (2) Width: 32.00"
Armless chair (2) Depth: 40.00"
Armless chair (2) Height: 37.00"
Although this sectional took 4 months to get to me, I am so happy with my purchase. This couch is so comfortable. All my guests LOVE it. You do have to fluff them though which is the only downfall, but that’s the reason why they are so comfy you just sink into it. My daughter falls asleep on it all the time. We call it the knock out couch.... love this sectional!!!! This is the couch of all couches! If you want a cozy, beautiful couch to sink into than this is the one! Seriously, if you’re sick this is the couch that will love you back to health!! After supporting you all day, your feet deserve a break. Rest them on the Savesto oversized accent ottoman. Cottony soft fabric in dreamy ivory hue brightens up your space. Be unapologetically selfish and sprawl out on its generous scale. With the feather-filled cushion, you’ll feel like you’re floating on a cloud. After supporting you all day, your feet deserve a break. Rest them on the Savesto oversized accent ottoman. Cottony soft fabric in charcoal gray hue is a breath of fresh air. With the feather-filled cushion, you’ll feel like you’re floating on a cloud. Go on. Be unapologetically selfish and sprawl out on its generous scale. Looking comfortable. Feeling comfortable. That’s what modern farmhouse living is all about. What better way to embrace the modern farmhouse trend than with the Savesto 3-piece sectional in charcoal gray. As casually cool as they are luxurious, the sectional’s reversible back and seat cushions are feather filled and wrapped in a cottony soft fabric for cloud-like comfort. Crisp, clean lines and track arm styling simply work. Looking comfortable. Feeling comfortable. That’s what modern farmhouse living is all about. What better way to embrace the modern farmhouse trend than with the Savesto 5-piece sectional in charcoal gray. As casually cool as they are luxurious, the sectional’s reversible back and seat cushions are feather filled and wrapped in a cottony soft fabric for cloud-like comfort. Crisp, clean lines and track arm styling simply work.